Tuesday April 28th 1925 I did not do much of any thing in AM. Rode to town with Fannie in PM and was at Aunt Emmas. After I came home did up package and wrote letter to Mrs O'Leary in Washington. Letter from Lydia. Wednesday April 29th 1925 It rained some today. Early in the afternoon. Mrs Records same and took us over to Hatties a pleasant little party. A letter from Ida says Aunty is very sick. I wrote her in the evening. 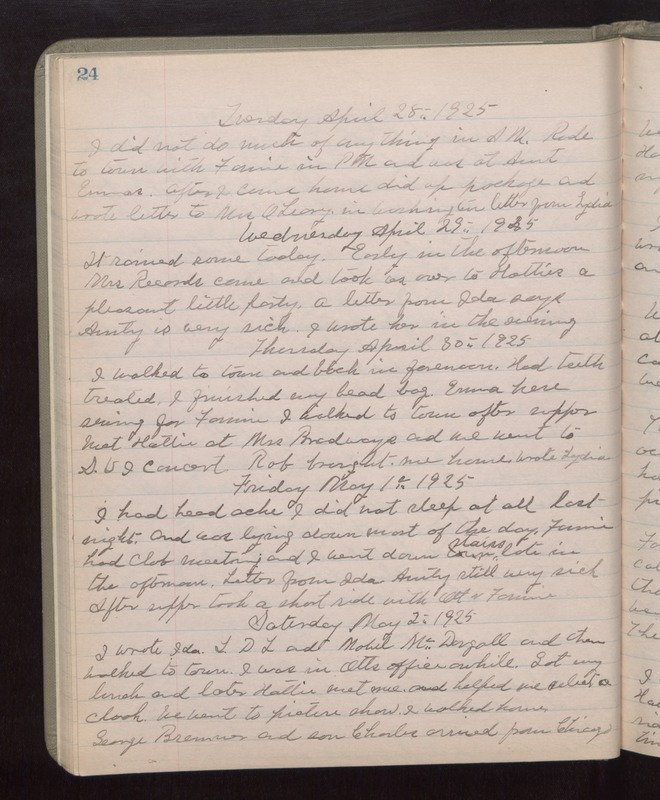 Thursday April 30th 1925 I walked to town and back in forenoon. Had teeth treated. I finished my bead bag. Emma here sewing for Fannie. I walked to town after supper. Met Hattie at Mrs Bradways and we went to S U I concert. Rob brought me home. Wrote Lydia. Friday May 1st 1925 I had head ache. I did not sleep at all last night and was lying down most of the day. Fannie had Club meeting and I went down stairs late in the afternoon. Letter from Ida. Aunty still very sick. After supper took a short ride with Ott & Fannie. Saturday May 2nd 1925 I wrote Ida, L D L, and Mabel McDougall and then walked to town. I was in Otts office awhile. Got my lunch and later Hattie met me and helped me select a cloak. We went to picture show. I walked home. George Bremner and son Charles arrived from Chicago.